So now we move to the real powerhouse of college football, the South Eastern Conference, better known as the SEC. Due to time constraints, I will only be focusing on some key schools within both divisions of the SEC. However, like I have previously mentioned, I will be revisiting some of these other programs later on this college football season, so don’t worry college football fans. Anywho, back to the SEC! Welp, time to move onto the Gators, and my feelings towards those down in Gainesville can be summed up with the following hashtag… #BeatFlorida. That’s right, I hate ’em! I especially hate them because of all those years that they had success under Tim Tebow. It’s not that I personally hate Tebow, I just didn’t like their success. The Gators start the year ranked #10 in the nation, with QB Jeff Driskel at the helm. The junior appears poised for what could be a stellar breakout season for him. The one key for Driskel will be how he will manage the Gators’ conservative offense. 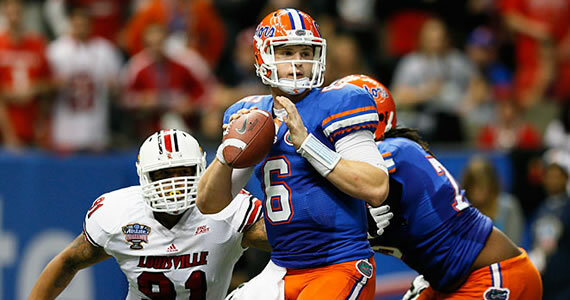 In 2012, Driskel threw for more than 175 yards just three times! However, he only yielded 5 turnovers… Nice job.! Florida will rely heavily on their defense to help them stay competitive for 2013. UF will not be as dominant against the run as they were a year ago, when they ranked #4 in the nation in run defense. However, the self proclaimed “Bash Bros” team of Dante Fowler (17 assists on tackles, 2.5 sacks, 12 solo tackles) and Jonathan Bullard, look to keep their defense dangerous once again this year. Can someone please beat these guys?? This season, LSU looks to show some muscle by avenging their two big losses from last season, against defending national champion Alabama and the aforementioned Florida. 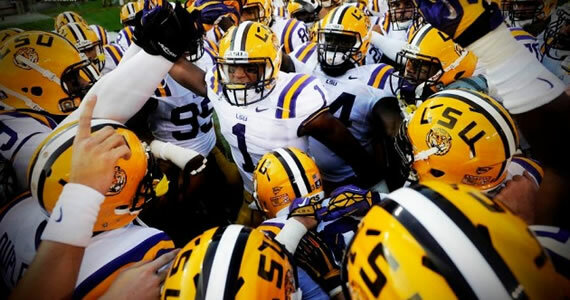 The major key for the Tigers in 2013 is whether they can withstand what is a very loaded and dangerous schedule. LSU has to make very big road trips to both #5 Georgia and #1 Alabama. In order for LSU to be successful this year, the offense must rely on star QB Zach Mettenberger (207 of 352, 2701 yards passing, 13 TDs). Entering his junior year, he is sure to be the go to guy that all Tiger fans will look to. Given time, he has the ability to pick apart SEC defenses. If they can do that, LSU could be in the talks for a national title along with those other guys. Also, can this defense can contain anyone? Just ask Johnny Manziel, who we are getting to… now! The Johnny Manziel circus continues… Now, we can all sit here Indian style in a semi-circle and ask all of the Texas A&M players what everyone did over the summer. It would be fun, and then we would get to Johnny Manziel. We would try to sound surprised and act like we didn’t know what he had been up to. Just to be clear, I was going to try to shift the focus of this post to the entire A&M team, and try to stay away from the whole Johnny Manziel sideshow, but I just couldn’t! Just know that Texas A&M, in only their second season in the SEC, will be heavily favored to win the conference and contend for a national championship. They’re good, everyone! Now, back to Manziel. The youngest player to ever win the Heisman Trophy did not exactly have a quiet summer. He was seen going to lavish events, blowing up twitter, getting kicked out of frat parties, reminding everyone how he’s just a 20 year old kid, and of course who can forget the biggest story of them all!? A couple of weeks ago, sources emerged saying that Manziel “allegedly” received cash donations for autographs. If these allegations were true, Manziel could have lost out on his athletic scholarship and playing eligibility. Luckily for him, and of course Texas A&M, the NCAA found no evidence showing that Manziel received monetary reward in exchange for autographs. The appropriate actions were taken by the school for his lack of discipline, and he was suspended for the first half of the season opener vs. Rice University. How did he handle it all? 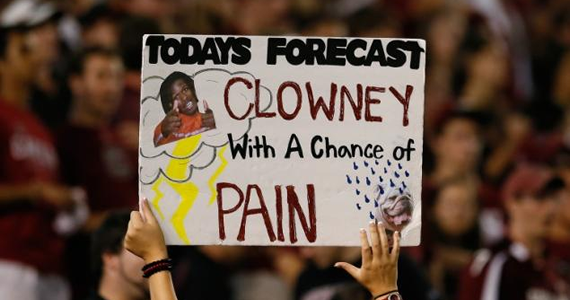 Well, he scored 3 TDs in the 52-31 drubbing over the Owls. Did Manziel really learn anything from his actions though? 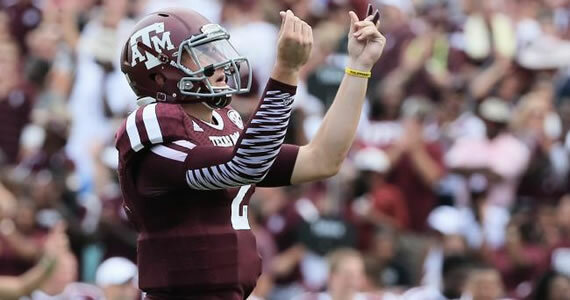 During the game, he would score and promptly starts making dollar bill gestures to the opposition. He even got flagged for an unsportsmanlike conduct penalty, although all he did was point to the scoreboard after talking trash to a member of the Rice defense, which isn’t that crazy. Either way, I am sure that his coaches all thought the same that I did… Way to stay classy, Johnny Football! But hey, give him a break everyone. He’s just a 20 year old kid playing football. 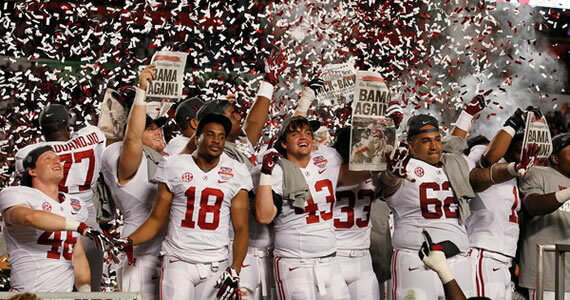 Can Alabama Three-peat? I am sure by now you have all picked up on a key phrase in this post, which is “national championship!” You may have also noticed that basically every legit team in this conference has a chance to play for a title. 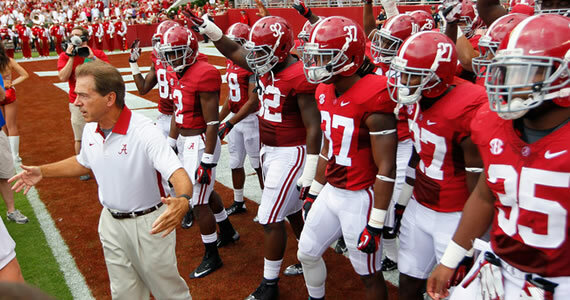 This brings me to my last team, two time defending national champions, #1 Alabama Crimson Tide. What can we expect to see from this group in 2013? Well for starters, they return QB A.J. McCarron (lead the nation in QB passer rating). They also have what many consider to be the best running back in the country in T.J. Yeldon, who had 1100 yards rushing with 12 TDs last year. Oh, and you can’t forget the wide receivers either. They return their top three receivers from last year, including standout Amari Cooper (1,000 yards receiving and 11 TDs, as a freshman!). On defense… well, they already showed the other night against Virginia Tech why they are going to be the heavy favorites to three-peat as national champs in 2013. They return five of their top six linebackers and boast probably the best group of safeties in the country. Oh and you can bet that those diehards in Alabama have next week’s game at Texas A&M highlighted. ‘Bama should be raring to go seek some revenge against those Aggies. If they can make it out of College Station with a win, we’ll probably be seeing them in the SEC title game come December, because the rest of their schedule shouldn’t be too difficult for them to handle. All of this hype leads every sports analyst and broadcaster to think that Alabama may become the first college football team in history to three-peat as national champions. Only time will tell.